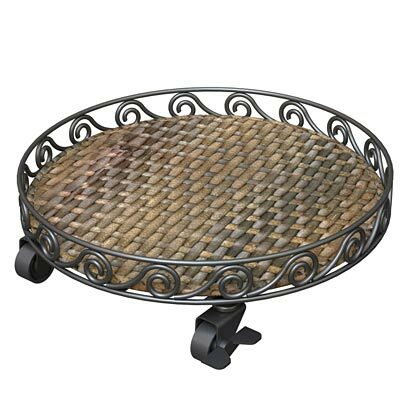 Mix classic lines with modern materials on your patio or deck using this Panacea Espresso Woven Resin Plant Caddy. A sturdy, metal frame with elegant scrolls forms a durable caddy, while resin strands in a basketweave pattern create the interior base. Varied, dark brown hues contrast the black frame, and this area easily holds a pot up to 13.5" in diameter. Four casters on the base of this caddy not only allow you to reposition your plant; two of them also may be locked into place, preventing the item from rolling around in the wind. Metal rods on the base of the unit offer additional support for your plant, while the open weave of the resin ensures plenty of drainage. The varied colors on the resin evoke wicker, while remaining durable for many seasons. Elevate a potted plant in style using this Espresso Woven Resin Plant Caddy.